One of CrossFit’s most veteran masters, Mary Beth Prodromides (formerly Litsheim) is a seven-time CrossFit Games masters athlete and a four-time world champion (2011, 2014, 2016, 2018). A former bodybuilder, Prodromides started CrossFit in 2010. Just over a year later, she won the Masters Women 50-55 Division at the 2011 Reebok CrossFit Games. She returned to the Games for the coming years, earning five more podium finishes (second in 2012 and 2017, and three first-place finish in 2014, 2016, and 2018) an injury sidelined her in 2015. Prodromides came back strong in 2016 taking the third championship of her career, this time in the 55-59 Division. 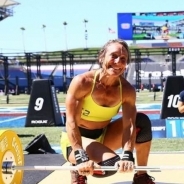 Prodromides is the first woman ever to have earned 4 World Crossfit Master's Championships. Prodromides is a middle-school P.E. teacher in in Grand Junction, Colorado.